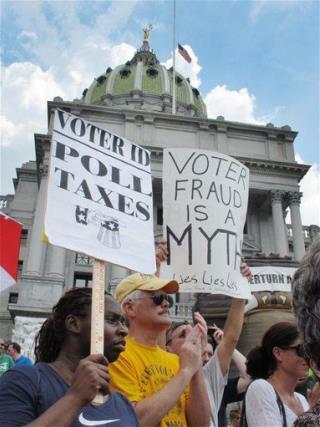 (Newser) – A Pennsylvania judge today refused to stop a tough new voter identification law from going into effect, which Democrats say will suppress votes among President Barack Obama's supporters. Opponents are expected to file an appeal within a day or two to the state Supreme Court as the Nov. 6 presidential election looms. "We're not done, it's not over," says an American Civil Liberties Union lawyer who helped argue the case. "It's why they make appeals courts." In … April a Tunica County, Miss., jury convicted NAACP official Lessadolla Sowers on 10 counts of fraudulently casting absentee ballots. Sowers is identified on an NAACP website as a member of the Tunica County NAACP Executive Committee. Sowers received a five-year prison term for each of the 10 counts, but Circuit Court Judge Charles Webster permitted Sowers to serve those terms concurrently, according to the Tunica Times, the only media outlet to cover the sentencing. I hope it backfires on the Republicans..I live in Pennsylvania and the next county from me (Fayette County) is probably the poorest county in Pa..Some of these people live in shacks.And the last election that county went Republican!!!! !..Everyone there is probably on welfare..I don't know why ...Maybe faith...Maybe fear..But I don't think I would cut off my nose to spite my face..Anyway if these people can come up with proper ID i would be amazed.